Project obstacles and solutions: St. Elizabeth East Hospital in Lafayette, Indiana was renovating the second floor on the north side of the hospital to accommodate their surgery center. 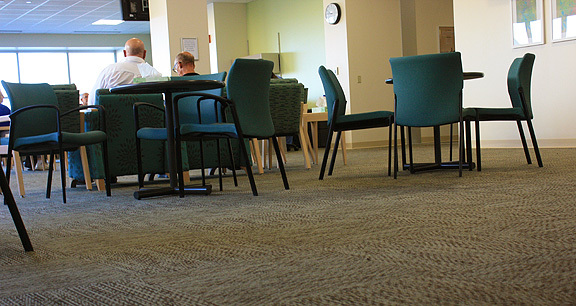 The renovation included building a new second floor waiting room. Tonn and Blank Construction made plans to build out the new waiting room. They needed two features in the elevated concrete floor. First, they wanted a lightweight concrete. Lightweight concrete is commonly used in upper decks to reduce the amount of structural steel required in a building. Second, they needed the floor to dry out quickly so they could apply carpet squares and keep the job on track. Tonn and Blank had previously experienced finished flooring failures due to excess moisture in the concrete breaking down the adhesives used to adhere carpet to concrete. They were looking for a solution that would guarantee the floors would stick. By its very consistency, lightweight concrete has a tendency to hold water longer than traditionally-weighted concrete. The coarse aggregates that are used to make lightweight concrete are filled with air voids, causing them to weigh less than natural aggregates. These voids fill up and hold water as the aggregates are soaked prior to mixing the concrete. Producing a lightweight concrete and getting it to dry out quickly seemed to be two divergent ideas. However, IMI suggested using Aridus Rapid Drying Concrete in the lightweight mix. Aridus chemically dries concrete from within the slab. It is commonly used in buildings where there is a quick construction turnaround time. Aridus has been tested to be safe for final floor coverings in 45 days or less if the building is enclosed and the HVAC system is operating. It is also guaranteed to stay dry for 10 years. This is key in hospital operations where shutting down a surgery center to mitigate and replace flooring failures would have been disastrous. This is what Tonn and Blank had previously experienced and was looking for such a guarantee. Tonn and Blank poured 25 yards of lightweight Aridus Concrete for the second floor waiting room. The new floor was finished with carpet squares and linoleum block tiles. There were no issues with any of the adhesives breaking down or tiles coming loose.